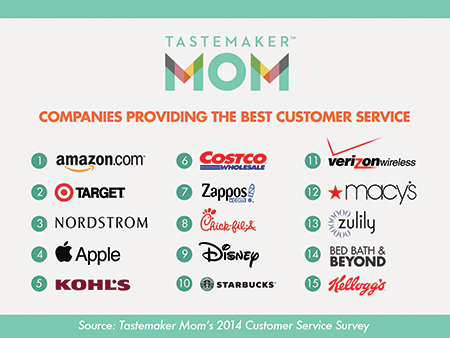 In August 2014, moms across the Unites States spoke out about their favorite companies to interact with, as well as sharing their most challenging customer service stories in Tastemaker Mom’s 2014 Customer Service Survey. With over 300 Tastemaker Moms participating, we identified those companies that understand moms and those that need a refresher course. Amazon.com is the undisputed leader of companies that moms associate with exceptional customer service. Following Amazon.com (chosen by 26% of Tastemaker Mom respondents), were Target (16%) and Nordstrom (8%). While Amazon took home the customer service crown, we found it interesting that only three of the top 15 on the list were internet-only brands (Zappos at #7, and Zulily at #13). • Moms don’t easily forget negative customer service interactions. 85% of moms can recall a recent, negative experience. • Moms love to share. 95% of moms share their memorable experiences with their social circles, with 76% posting their experiences online. • Moms will give you a second chance. 35% of moms that described a negative customer service experience with a brand said they would still recommend that brand to others. • An apology will go along way. An astounding 83% of respondents would be interested in engaging further with the company that delivered the negative experience. • Moms rely heavily on both retail stores and websites for their shopping. 58% of moms stated their shopping is evenly split between retail and online, with 25% saying that most of their shopping is done in retail, and the remaining 17% dominated by online shopping. • What really angers moms? Unfriendly return policies, difficulty finding store employees for help, challenges in reversing double charges on a credit card, inattentive cashiers, and too many hurdles to clear when trying to use a coupon (to name a few).